With the deadline for entering now passed it is time to provide answers to the 2018 London Reconnections Quiz. This is our initial offering of the answers. However so many of you provided so much interesting additional detail, in time we hope to augment the details with some of the information given by those who provided rather more than the bare minimum needed to answer the question. We asked what was common about four events in 2018. This was an opening question designed to get your into the swing of things and everyone seemed to realise that they didn’t happen in 2018 but should have done. The injunction that was lifted in 2018 was for the order for Siemens to provide new trains for Piccadilly line. It has been suggested that the CS11 injunction has also been lifted but, as yet, we have no evidence of this although we do know there was a hearing in October where an application was made to have it lifted. For information, note that the lifting of the injunction is only for the Piccadilly line order. 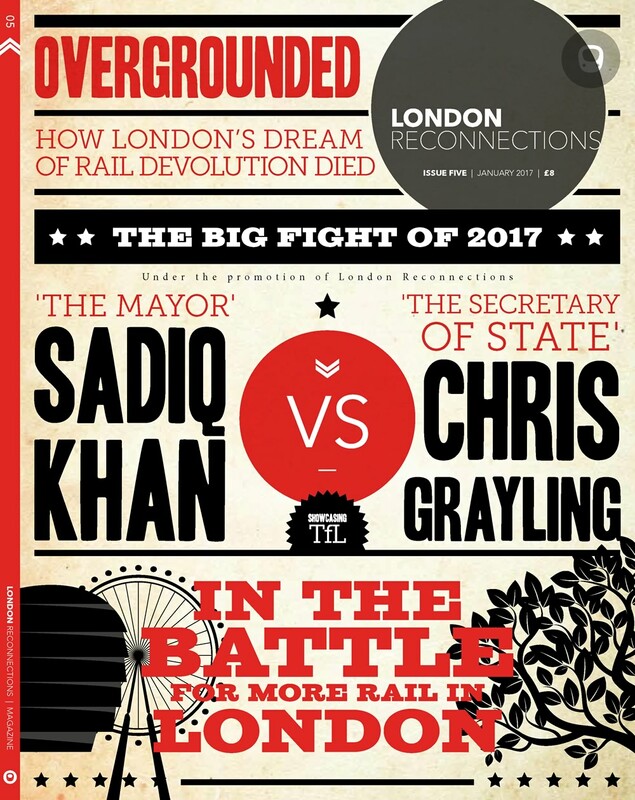 Any follow-on order (for the Bakerloo line, for example) is still subject to an injunction but there is no urgency to sort this out and a hearing in the High Court will eventually take place to determine whether or not this too should be lifted. The Emirates Air Line (cable car) has satisfaction increasing when the service runs more slowly. Obvious when you think about it although we can see the logic of suggesting it might be the boat service. We asked which TfL service had been closed for around seven weeks in 2018. As expected a lot of people said the Gospel Oak – Barking line but that was in 2017 (and for longer). The correct answer is the Woolwich Ferry which cannot operate whilst they rebuild the approaches to be compatible with the new ferries. You will not be surprised to learn that the Woolwich Ferry was due to reopen ‘in late December 2018’ but hasn’t yet done so and no date has yet been announced. Harlesden station still has an officially open ticket office on London Underground. When it was announced that closure of ticket offices at London Underground stations would take place, those that also served London Overground were not included in the ticket office closure list. Subsequently, once more advanced ticket vending machines were installed, the decision was made to close these ticket offices as well. We understand that the problem with Harlesden is that the ticket office floor needed strengthening before a new vending machine could be installed that was protected from the elements so its closure got delayed – though there is considerable doubt as to what its actual opening hours were (if at all). Officially it closes on 2nd January 2019. See this TfL webpage which refers to it closing in early 2019. This was the first of our questions that went beyond ‘London’ – hence the ‘London’ in quotes in question. It is actually (London) Southend Airport station. This was the question were you had to name saints whose name was referenced in a station name. Questions like this are always set with a certain amount of trepidation as we don’t necessarily know all the answers ourselves. On the other hand, we don’t need to know in advance and we learn something. Note that you could have also have had Marylebone for St Mary. We haven’t investigated further but two of you suggested that Ladywell was also valid for St Mary. We specifically included all of London Overground so that St Margaret would be included. We were really looking for stations located a considerable distance apart but St Paul had different stations in the same locality named after the cathedral that bears his name. They are St Paul’s (Central line), St Paul’s Thameslink (original name for City Thameslink) and St Paul’s (original name for Blackfriars main line station). Please note there is no station at St Paul’s Cray. We didn’t allow St Quentin. Both Wikipedia and the Disused Stations website regard it as a single station that had two sites. St Pancras (specifically excluded as it was just one big station complex). We certainly did not allow St Victoria as the name Royal Victoria makes it pretty obvious it was not named after a saint. So, by our reckoning that is a total of five valid answers. Note that you only had to get the saint’s name correct to get the point in each case. We will examine other claims as we encounter them. The event at Clapton we were looking for was the first British powered flight. There is a plaque commemorating the event and various write-ups including mechtraveller. This is probably a very difficult question if you didn’t get question 8 as it contained the hint that it could perhaps be considered related to the previous one. In fact the thing in ‘qommon’ is that they have IATA codes (which start with ‘Q’). This might not be surprising for Paddington and Victoria which used to have check-in desks for Heathrow and Gatwick respectively but for King’s Cross (and not St Pancras) it seems a bit strange. Transport Trivia: There is an excellent video by Geoff Marshall on Paddington which include the tunnels related to the check-in baggage at Paddington. Most of the questions are about London but we may stray well beyond that geographically, if not thematically. Never overlook the innocent-seeming first few paragraphs prior to the questions. There were other clues. We referred to Regents Park not Regent‘s Park. And, more obviously, we referred to Kings Cross whereas the previous question had referred to King‘s Cross. For those who still haven’t realised, we described a sequence of journeys that could take place in Sydney, Australia, on a dry day at the height of summer. So there was plenty of opportunity to describe the clothing in a manner which would make it obvious you realised we were talking about location where the temperature at that time of year would be expected to be really hot (average 26°C). We expected the partially blanked-out road sign to present more of a problem than it did. The problem was that the one road was marked as banned for motor vehicles except for access. Most people recognised the layout as the junction at the east of Westminster Bridge which used to be a roundabout and in now a ‘peninsula’. 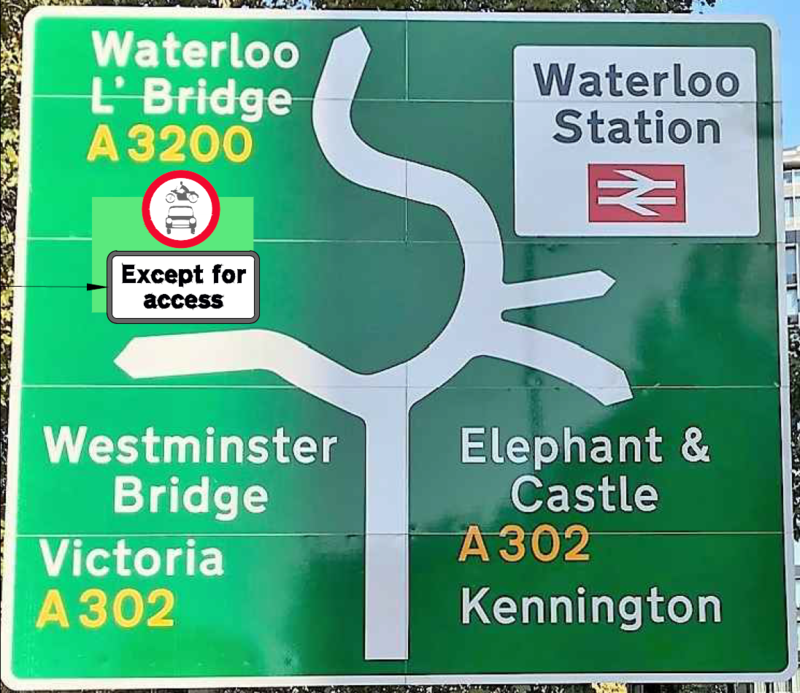 We get the impression most people just ignored the issue of ‘except for access’ which was caused by the City of Westminster conducting trail boreholes in Bridge Street outside the Houses of Parliament. The sign is located outside St Thomas’s Hospital on Lambeth Palace Road. The image had a name beginning with PieChartPolulariser and was a reference to Florence Nightingale. The Florence Nightingale museum is located at the hospital. Florence Nightingale was an educated well-connected statistician who did a lot of analysis on treatment of soldiers injured in the Crimean war to discover the best, most effective medical treatment to promote recovery. To present the figures in a meaningful way she used pie charts – an invention generally credited to Lord Playfair but often mistakenly attributed to Florence Nightingale. She was also a nurse. Like question 10, King’s Cross wasn’t the King’s Cross you were expecting it to be. This was yet another King’s Cross. This one was a port on the Isle of Arran also known as King’s Cross Point and the Duchesses in question were ships, specifically paddle steamers, that would have docked there. The shipping service was run by railway company. The common feature is that all these routes have electric buses on them. In the case of route 98 it is only a small portion of the total service but for the others they are entirely operated by electric vehicles. Transport Trivia: According to Diamond Geezer, in times gone by, Finsbury Fields (in the vicinity of where Finsbury Square is today) was commonly used for duels. Mistakenly this has been confused with Finsbury Park which has led to the Victoria line platforms at Finsbury Park station having a motif of two duelling pistols. A search of Transport of Delight will reveal that this is the title of a song by Flanders and Swann about … a London Omnibus. Clad in iron at the home of tin, a small piece of me can still be found…. You have our editor to blame for the corny pun. You need to realise that the home of tin refers to Canning Town. This will help you identify the object as Iron from HMS Warrior. This year’s quiz included a return to a minimal diagram question – this time with two locations. The first location, a yellow circle near the Doric Arch (symbolising Euston) represented Richard Trevithick’s circular demonstration railway in the area of Gower Street. It was variously known as ‘Catch-Me-Who-Can’, Euston Circus or Steam Circus. The clue in the image name was NoClowns. The second location, on the north bank of the Thames SSE of Heathrow Airport represents the current day remnant of the Metropolitan Water Board railway at Kempton. See the Hampton & Kempton Waterworks Railway website. The location is Hammersmith Underground station. The image is a reflection of Hammersmith Bridge. No-one was fooled into thinking we were talking about Heathrow Express when we referred to a non-stop train between Paddington and Heathrow. Until 8th December the 04:56 from Paddington (Mondays to Fridays) ran non-stop to Terminals 2 & 3. The timetable is still available on the TfL website. Because the journey a user would go through the ticket gate at Paddington before 06:30 off-peak fares apply so, with an Oystercard, the fare would be £10.10. A surprising number of people got this part of the question wrong. 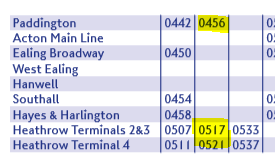 One responder suggests, with evidence, that the Working Timetable shows the train in question actually stops at Hayes & Harlington. What we don’t know is whether passengers were able to board or alight or whether the stop always took place. Regardless, from a passenger perspective, it would normally be treated as a non-stop train. The connection between the locations in black and locations in blue is signal boxes (or ‘cabins’ in American-based London Underground speak). Or, more precisely, signal frames. Hence the clue in the image name of ‘You have been’ (framed). Even more precisely, as some people pointed out, the connection was Westinghouse signal frames with one entrant even listing the individual type of frame in each case. This is well beyond what we were expecting or required. The blue location was the original location and the black location is where the signal frame is preserved. This would be Beckonscot model village at Beaconsfield, the railway museum at Kidderminster on the Severn Valley Railway or National Railway Museum at York. The intended answer for the ‘odd one out’ was Borough Market as the entire box has been preserved rather than just the frame. However, unlike ‘Have I Got News For You’, any good well-reasoned answer will be accepted. Any answer that names Borough Market and alludes to the box itself being preserved (unlike the other examples) will get the point. For more about the preserved Borough Market signal box see a recent article by IanVisits. We hope to update this with one or two of the excellent alternative answers. The railway with the large female intake was the Sodor Railway – best known for Thomas the Tank Engine who runs on it. We were thinking of the locomotive department (the locomotives themselves) when considering equality but others have pointed out that controllers (having gone from one to two) could also be argued to have achieved equality. It does not matter which it is – we only asked for the name or a description of the railway. The former Feltham Marshalling Yard no longer has the hump and will see class ten class 701 trains stabled there in the next couple of years. Meanwhile, at Feltham station, the level crossing is disappearing meaning motorists will have to use the nearby bridge and pedestrians will no longer be able to cross to get to the town centre without having to climb the steps of footbridge. Cyclists will also be inconvenienced. Two answers put forward a persuasive case for Ripple Lane Yard and the extension of the London Overground to Barking Reach. This is being considered. a) In 2018 the Jubilee line increased the frequency of trains to Stratford. To accommodate this the ‘stepping back’ procedure was introduced at busy times (most of the day) so drivers take out the following train to the one they came in on at any given platform. To implement this most trains now arrive and depart from platforms 14 and 15 and platform 13 at Stratford is little-used. A similar situation has happened at Morden on the Northern line when 30tph to Morden was introduced. We will also allow North Greenwich platform 2 as it is clear that it has been grasped that we are referring to the updated timetable on the Jubilee line. However, the service at North Greenwich, when measured in tph at the station, hasn’t improved. It is just more trains are through trains so fewer terminate at platform 2.
b) Tottenham Hale is expected to get an extra platform which logically ought to be platform 0 so that gets the point. It was pointed out that one could reasonably expect the same scenario to occur at Northumberland Park so that will also accepted as a valid answer. However, we had completely overlooked these two obvious answers and were looking for something more obscure. What we were actually looking for at the time the quiz was set was Elmers End on the basis that it was originally expected that a second tram platform would be built next to the current tram platform which is designated ‘platform 1’ – so logically should be platform 0. As it turns out, there appeared to be a delay to the tram platform construction for which “funding is committed” so the 2019 date was in doubt. And, more recently, it has gone very quiet with all reference to the new platform removed in the Mayor’s revised draft budget issued after the full financial consequences of the Crossrail delay was known. So it was probably just as well that alternative answers to the one we intended presented themselves. As is well-known, King’s Cross has a platform 0 currently in use. c) Paddington no longer has a platform 13. Nothing to do with superstition, platforms 13 and 14 were short and would have been fairly useless once 8-car GWR class 387s and TfL Rail class 345 trains were introduced. It was decided to abandon platform 13 in order that platform 12 could be lengthened. The only real use for a short platform was for the short train used on the Greenford service – now cut back to West Ealing. It is going to take a while to sort out the winners and we have a couple of articles to publish shortly that can’t be left for too long so please be patient. Early indications are that no-one has got every question correct but that quite a lot of entries have very few questions wrong or incomplete (one, two or three incorrect or unanswered ones). I believe a correct answer to 22c would be Bristol Temple Meads. 5, which service was OOS for ~7 weeks as of December, would be the Waterloo & City Line, as that is closed 1 day per week and at the start of December you’ve had about 48 weeks of the year. Are you sure Temple meads has a platform 14? Unfortunately, I was a bit busy during December and wasn’t able to dedicate enough time to the quiz and it didn’t seem worth it to submit the few answers that I had. That said, I at least managed to find the right answers to questions 1,2,3,8,10,11,13,17 and all parts of 22 along with with 2 answers (St. Mary & St. James) to question 7. If I had more time I probably would have got a few more but still fallen well short of perfect so I’m not too disappointed about it. Q4 – I at least managed to rule out the GOBlin as I reasoned it had been closed for longer than 7 weeks. However, I also forgot that the Woolwich ferry had been closed for as long as it has and so it didn’t occur to me. Q6 – I suspected it was one of the airport stations although I had no idea which one. Q10 – …was one of my favourite questions. It also didn’t give me any trouble as I was quick to realise that it was refering to Epping down under as opposed to Epping in Essex. Q11 – I quickly recognised the junction but was thrown for a while by the ‘except for access’ sign which looked like a bad photoshop job. Something I noticed later is that if you stare long enough at the blanked out version of the sign, you can just about make out the words ‘Waterloo Station’ although I didn’t let on about it until now. Q13 – As I pointed out in the other comment section, I immediately recognised the 153 as it was a route I travelled end-to-end on back in the summer! Q14 & 20 are good examples of questions I might have gotten if I’d had more time. 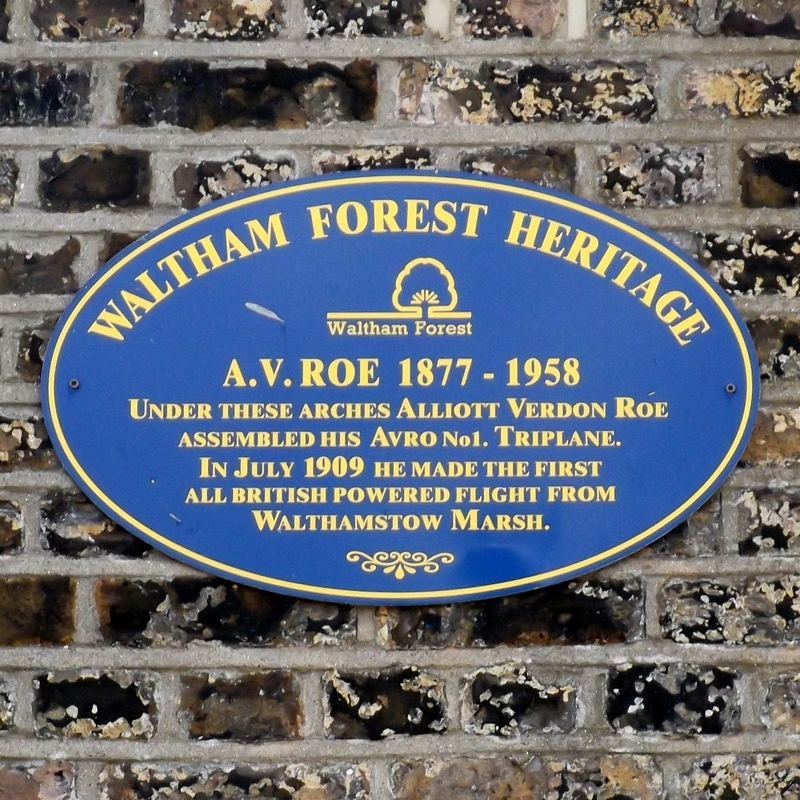 Q22b – I had all 3 answers: Tottenham Hale, Northumberland Park and Elmers End although I later ruled out Elmers End. Either way though, let’s hope I get more time to do this next year. I have no reason to doubt the answer to 22c is correct but it makes it difficult for those of us trying to confirm answers from afar when Network Rail’s map of Paddington is not up-to-date. thenewo2- according to Network Rail there are platforms 13 and 15 at Temple Meads but no 14 but who knows how accurate their map is! The Doric arch looks similar to a museum symbol on an OS map, which is what I took it to be, and there was both a heritage motor museum and a miniature railway which ran in a loop at Syon Park in the 1990s. There’s also a railway and a museum at the museum of steam in Kew, but the railway runs in an out-and-back crescent and – as far as I can ascertain – never a loop. Either of these would be a better fit for the position shown relative to the river and LHR than Gower St. The railway on the Island of Sodor is the North Western railway. NW can be seen on the sides of trucks in some of the original illustrations. At North Greenwich, the frequency of the Stanmore-Stratford service increased (at the expense of the Stanmore-N Greenwich service) which directly resulted in the reduction in use of P2. Glad that this answer has been allowed. I tend (deliberately) not to check whether answers to my questions can easily be determined online but also tend to pose and word them in such a way that a simple web search will not reveal the answer. Network Rail’s website (and National Rail’s – run by RDG, formerly ATOC) maps and diagrams are notorious for not being up-to-date. I wouldn’t rely on ticket office opening hours either! Some sympathy but there were very few wrong answers to the diagram question. Nearly everyone either got it or, in few cases, left it blank. I don’t think the Ordnance Survey Museum Symbol is similar to my Doric Arch symbol. The Ordnance Survey one has a massive great ‘M’ in the middle. See page 2 of Ordnance Survey Raster Legends. Regarding Waterloo for the ‘hump’ question, I can’t see how ‘Meanwhile, changes at a nearby station’ fits in. If your answer is Waterloo then you can’t simultaneously claim that Waterloo is a nearby station. Another answer given was Abbey Wood which was rejected for this and other reasons although superficially can be made to fit the conditions. A further problem here (as in Waterloo) is that there are already trains there. The phrase ‘will see trains in the next year or so’ implies there are no trains there now. Similarly (take note TheNewNo2) closed for around 7 weeks in 2018 implies a continuous period and that it was something unusual that happened in 2018 and not something that happens every year. I am not that keen on setting questions with the Waterloo & City line as the answer. Correct or part-correct: 1,2, 7, 8., 10, 11, 13, 14, 17, 20, 21,22. Flat wrong: 3, 4, 5, 6. 15, 16 ( arrgh – I even thought of the waterworks railway! ), 18 – actually I DID think you meant the unspeakable HeX “services” – oh dear. 9. King’s Cross is/was the Zero mileage point for the GNR, York famously had a milepost Zero, destroyed in WWII, Manchester London Road (Piccadilly) was the zero for the MSLR & for Uppsala, I suspect that it is similar for the minor line there. 12: The person who was Duchess of Argyll was Princess Louise, the then Duchess of Hamilton was Nina Mary Benita, ditto the Duchess of Rothesay was Princess Alexandra of Denmark. All were, of course Stanier Pacifics …., so, using LMS numbering: 6204, 6229, 6224. Nice to see I got a few right from a limited amount of effort. I didn’t expend time on the more obscure questions so well done to those who did manage to work things out correctly. Not sure whether my answers for QQ18 and 19 will be accepted, but I got everything else I think. Q5 – I found this by checking the National Rail station information pages. Harlesden was the only one with a ticket office managed by London Underground. Q7 – I wondered whether St George would count. Although George Street in Croydon (named after the George & Dragon pub, not a king) is disqulified as a tram stop, and St Georges Circus on the City & Brixton Railway was never built, there were two quite separate stations of Shadwell & St George in the East (now plain Shadwell) on the East London Railway, and Shadwell & St George’s East on the London & Blackwall Railway – closed in 1941, and not on the same site as the current DLR stop. Q10. I guessed these were colonial namesakes. Googling “Epping station” found one in Sydney and the rest followed. Q14. Despite the question setting off both tunes as earworms, it was a long time before I remembered the penultimate line of the penultimate verse of Psalm 23. Q15. Maybe it’s because, even after 19 years, my mental tube map doesn’t include the Jubilee Line extension, but it took me a long time to recognise Canning Town as the “home of tin”. It was only when reading through Geoff Marshall’s Tube Trivia book for inspiration that it hit me – although I had to dig deeper for the actual answer. Q16. The position of the yellow circle relative to the river made me think it might be the Kew Bridge museum, but I plumped for Trevithick’s little circus instead, mainly because of the image name. Q19. My answer for the odd one out was Purley/Beaconsfield because the frame is still in use, controlling the Bekonscot railway. Not sure if this will be allowed. Q20. Sodor’s motive power department may now be 50% female (difficult to assess because some characters are now rarely mentioned but have not actually been killed off) but it has not been “all-male” since the arrival of Daisy the railcar in 1961. Hence I went for the human department. Q21. Feltham’s level crossing was for many years the only one, as far as I am aware, on a one way street. Two others, both in Lincoln, have appeared in the past couple of years. Thank you once again for an interesting and diverting December. Will investigate St George. At issue is how different a station they were. I was aware there was one St George station but was struggling to come up with a second. Yours was one of two alternative answers that will be accepted. The other was a technical answer arguing that only one of the frames was powered (if I remember correctly). I do not even claim to understand it but the person even stated that originally they were going to go for Borough Market as the whole box was preserved so I could hardly deny them the point! Hence the ‘ previously-perceived all-male department’ in the question although that may not have been the original wording. I think making Daisy a diesel railcar just increases sexism rather than acts to overcome it. If I remember correctly it is a one-way street except for cycles. Or maybe that is just how it is in reality. I can’t see how zero mileage points is either related to the previous question on addresses the issue of having something in ‘qommon’. “quommon” – yes, but Common also …. Subsidiary q, actually, Are/were they all zero-milepost locations? Because, if so, then …. Meanwhile, I await an answer to my alternative Stanier Pacific suggestion …. Feltham’s one-way level crossing does indeed have signposted a contra-flow cycle lane, as does one of the two in Lincoln. Daisy was only the first female motive power on Sodor. She was followed by Mavis (a diesel shunter) in 1972, and in the TV era several others, starting with Emily (a Stirling Single). Coaches were always female. I wasn’t sure whether Sir Topham Hatt’s female counterpart would count, as she is his opposite number on another railway, rather than a colleague on Sodor. (Lady Hatt has, of course, always ruled the roost at home). 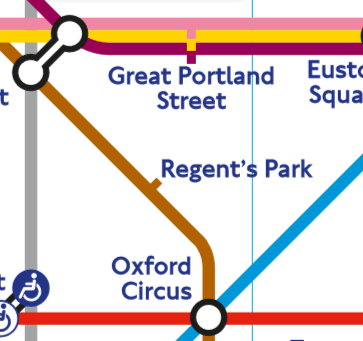 I wasn’t sure about the two St George in the East stations, and didn’t submit a revised answer to include it. As I understand it, the current Shadwell DLR station (which is shown as an interchange with the ELR station) is only about 50 metres further west than the original L&BR station. Q4 – the TfL Traffic status page has recently been updated. The Woolwich Ferry closure has been extended to the 15th. Kicking myself about Q10 being in Sydney and the IATA codes one, but pleased I got the Duchess one, and too much time in St Thomas’s Hospital has finally proven useful. I suppose by the next quiz, St Albans would qualify for Q7 (St Albans Road closed in the 40s), as it’s expected to adopt Oyster this year. Interested whether some alternative answers will be regarded as acceptable. For Q16 the Imperial Exhibition quarter north of South Kensington with the Albert Hall, Imperial College and the museums might qualify for an arch or monument, combined with the yellow UERL Piccadilly Line colour at South Kensington for the station. 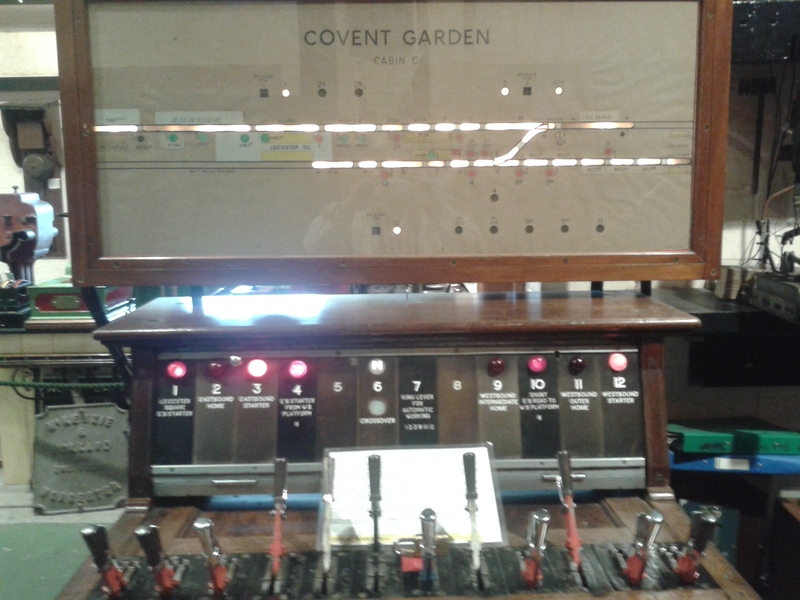 For Q19 there might be an alternative signalling frame solution – that 3 frames were Westinghouse and 1 was Sykes (Covent Garden). I am aware that PoP is to review other Saintly names for their validity. Q 12: As well as the “ships” answer …. I claim the following actually meets the criteria of the question, as set. All were Stanier Pacifics & the Duchess of Argyll was Princess Louise, Duchess of Hamilton was Nina Mary Benita, Duchess of Rothesay was Princess Alexandra of Denmark. Using LMS numbering: 6204, 6229, 6224. But the “real” Duchesses, the actual people could/would have used King’s Cross to get to Scotland, or wherever, wouldn’t they? Q18. A quick perusal of BR Fares gave me £10 weekend single on HEx. I didn’t get round to submitting but I am pleased with the ones I did get right 15 points I think. Or 16 if I’m allowed my answer to 18. The only one I answered by wrong was 21 where I managed to get Connaught Tunnel. There was reason for this but I can’t remember it now! I think St Alban will be unique in having one, and only one, station within Oysterland named after him (and therefore not a valid answer in the quiz). As far as I am aware there are no plans for the Abbey Flyer to become part of Oysterland – given the “special” status of Watford Junction it would get very complicated. Re Q16: I too thought museum (cf this google search – all the ones without an M are very similar to the icon used in the question), rather than Doric Arch. “NoClowns” as a clue suggests not a circus, rather than actually one – not that I’d heard of the right answer for that part of the question before the answer appeared. The ones I got wrong that I didn’t just give up on and do a blind shot in the dark (like the name of that railway near what I thought was a museum), were ones I got very close to the answer, but then didn’t – I’m not sure whether to kick myself for falling just a little short, or congratulate myself for getting so close! Daaaaamn, I really thought of Feltham but discounted it as I couldn’t find anything about the new sidings (and I didn’t know myself). timbeau: If the same question were to be re-asked after St Albans City is oysterised, but before St Albans Abbey is, then St Alban might qualify. Hessie intended, I think, to refer to St Albans London Road station. The question refers to “the area covered by Oyster”. For closed stations that is slightly harder to interpret, but considering how close the site of St Albans London Road station is to the Midland Main Line on the London side of St Albans City, it could be considered to be within the area. Perhaps. All quite hypothetical though. Sorry, just read the other comments again and noticed this W&C question has already been answered — didn’t think anyone else would have come up with that! Re Q19, I did get it right, but I also considered the odd one out potentially being one that was still in use for trains, and discounted it because I was under the impression that *both* the Beaconsfield frames are in use signalling trains. Am I wrong about that? Q7: Didn’t realise Oyster extended that far into Hertfordshire! I have searched a lot to stations referencing Margaret, considering there was a slim chance that references to royalty could refer to her (which they did not). There are now 7 steam locomotives in Thomas’s department, so surely it’s difficult for them to be 50% anything? Isn’t Stanmore’s ticket office still open when there is a big event at Wembley? Isn’t there some odd anomaly about season tickets at the two St Albans stations? So season tickets to London from stations on the Abbey Flyer line are valid via St Albans. Bekonscot – it is not clear from their website whether the Ruislip Gardens lever frame is in use, or just a static exhibit. Looking at BR Fares website, there are two fares fro a sampled Abbey Line station(Garston). An any permitted set by GTR and a route Watford Junction set by West Midlands Trains. Wasn’t it platform 12 at Paddington that was lengthened (by combining 12&13)? I think platform 14 is still the short one opposite the Hammersmith line platforms that it always was, if it has been lengthened it’s not by much. Also, platform 12 was definitely where the Greenford Shuttle (and Heathrow Connect) generally used to run from. A small point: the Ian Visits Borough Market hyperlink in the answer to Q19 doesn’t work for me, but https://www.ianvisits.co.uk/blog/2018/12/19/london-bridges-railway-signal-box-restored-in-york/ does. Re Q13 Trivia; I hadn’t heard about the duelling guns design at Finsbury Park, but it happened again when the Picc line platform tiling was updated. At the original launch of hot air balloon mosaics, they were explained as representing pleasure activities enjoyed in the Park over past years. I understand that they were actually envisaged to commemorate the first manned flight in England, which was made on 15 September 1784 by an Italian, Vincenzo Lunardi. He took off in a hydrogen filled balloon from the Artillery Grounds near Finsbury Square EC2, not Finsbury Park! The error was realised too late, and the design remains an entertaining enigma. Re Q2: The Bakerloo will be a small add-on order, probably for near identical trains. If TfL are forced to go to tender again, Siemens will be quoting having done all the development, pattern making, etc in the Piccadilly line order. Other manufacturers will need to quote to recover their costs from the small Bakerloo order, and be offering a product which will require further spares holdings and training, so they couldn’t be competitive. I guess this will all be evaluated in a compensation claim if TfL were in the wrong, but either way I can only see the Bakerloo getting more of the same when funding becomes available. The Central line will be more long term. I am sure most people initially thought of the Stanier pacifics but they had not been built “at the turn of the century before last”. I was convinced it is platform 14 that was extended and from what I can remember on the ground it seems obvious it is so. platform 12 was already long. However, I can’t find the original Rail Engineer article or any other obvious reference. You may well be right about the Greenford shuttle although I think it was said otherwise in the article I can’t find. If anyone else can confirm, either way, that would be appreciated. Stanier Pacifics would have been an unusual sight at the terminus of the East Coast Main Line anyway! You are correct … 11/12 was & is a bay & 13/14 was an island … then a connecting ramp was put in at the end of 12 & 13 was shortened a little. Then 13 was removed entirely & 14 appears to have been lengthened a little. Unfortunately getting from 15/16 to 14 used to be a quick up-&-over & is now a remarkably long & two-barrier trog, with near-invisible/unreadable departure screens – it’s called “improvements”. The ELR station at Shadwell is 70-odd steps below street level and the Docklands (L and B) well above. There is no off-street route between them so I would consider them separate stations. Which platform at Morden is less used than the others? I use the station a lot (although generally not in the peaks) and none of the platforms seems obviously less used as far as I’ve noticed. When I came to London from Sydney, I was amused to discover that although Lewisham, Petersham and Sydenham were all places in London, they were in completely different parts of the city. In Sydney, the three are right next to one another, and given the similarity of the names, they sound like they *should* be right next to one another. (Alas, the schematic rail map suggests that Sydenham is further from the other two than it actually is, but people using London’s tube map are used to that. Also, I do hope someone answering the “What are they wearing?” question included “thongs” in the answer. @Michael Jennings I did, for thongs! Speaking generally, how would you have known these answers? What resources did people use to find them out? (Sometimes the answers make this clear, but not at all often; I really liked the explanation of the thought pattern that you might use in 14, and am hoping for more explanations of thought patterns.) I lay claim to having got three correct, which is very probably more than I’ve got in any previous year, and I don’t claim to have more than a passing interest in the field at, roughly, the level of reading this site and watching Geoff Marshall’s videos. The ones I could get were from general knowledge of having read newspaper web sites over the course of the year and having previously been amused at the Kings (sic) Cross coincidence. Where do people who habitually get most of these correct most years do their research? Aha, I was including Thomas in the count! Perhaps the Mail knows something we don’t? Ah well, 20 right and 8 wrong. Better than last year, so I guess I should be satisfied. Q5 – The NR stations directory lists Farringdon as having a ticket office and being managed by London Underground. Would it not be an anomaly as the only station in the Thameslink core without one? Q9 – all four stations have through services to airports – which might explain why they have IATA codes. Q13 – I got two of the bus routes, but then mis-identified the 345 which sent me galloping off on the wrong track for the connection. Q18 – I found the 04.56, but failed to find the off-peak Oyster fare, so went with the £10.30 offered by National Rail Enquiries. Re: Paddington. Platforms 13/14 were originally the westbound Met/H&C tracks (with 15/16 for eastbound), so there was no platform-level connection to the main station, even after the ir reconfiguration as terminal bays for BR suburban services. Platform 12 was the milk dock, which diverged part way along 11 under the fourth roof span. Both dated from the 1912 remodelling, along with 9 and 10. As part of the recent lengthening for 8/12-car EMU operation, Platform 12 was extended out through the end archway to join up with the realigned outer end of 13, creating a ground-level walking route and a new ramp down to 14, which remains largely unaltered. Bristol Temple Meads has never had a Platform 14 in recent years. Because the platforms in the old B&E shed were double-numbered, with odds at the up end and evens at the down end, the reinstated single-length island to the east of the shed logically became 13 and 15 . It is telling that experts are unable to research an Oyster fare before being charged, the system seems to justify itself as being “less than advertised” for cash. On the quiz I am disappointed in myself for not recognising Southend, and forgetting Woolwich that seems to have remarkably little criticism. I missed the circle connection when choosing between the Circus and Despatch, opting for the more railway like despatch rather than a temporary exhibition/amusement. My 9 3/4 wasn’t embarrassing for an amateur. I thought of Euston Circus more as a significant technology showcase event. In my Ladybird book of Railways which I once had, many years ago, it featured early on when describing the history of the railways such was its considered importance. @Chris J I believe the Farringdon ticket office despite being at an LU-managed station is actually itself managed by GTR. Someone will correct me if I’m wrong here. @Aleks There are a few resources for this – the TfL Website has a “single fare finder”, and there are a couple of third-party fare finders using the open data as well (one on oyster-rail and one at ltfares.com). @Chris: I’ll go through my thought process (as I recall it) for all of them! Q2: This one rather stumped me. I googled for quite a while, not finding anything useful, and eventually came onto a language fluency requirement for private hire vehicles which they were allowed to implement. I didn’t see the word “injunction” anywhere but I decided this was probably the best answer I was going to get. It’s probably wrong. Q3: Well, I never found direct evidence that this was the answer, but in my mind it was between riverboat services and the Emirates Air Line, as the view you get from them is a significant part of both of them (they’re things you’d more do for the journey than for the destination, if you get my drift). After more Googling I stumbled upon the fact that the Emirates Air Line is actually sped up in the peaks, so I was pretty confident I had my answer here. Q5: Googling. Lots and lots of Googling. I was still stumped for ages, I spent a little while going down the Stratford route before realising that definitely wasn’t a LU one. I eventually remembered long ago reading a Diamond Geezer article about ticket office closures that I thought might had the answer, so I googled for Diamond Geezer only and sure enough found the obscure little fact about Harlesden in one of the more recent ticket office closure articles. I then searched for Harlesden on the TfL website to verify, and sure enough, found a little bit about the ticket office still being open. Q6: This one was easy. I figured out it was an airport quite quickly – besides the person with the luggage tag, it also just “looks” airporty. The “London” in quotes was also a big clue for me and I was immediately thinking of places that weren’t actually in London – so for places with railway stations, this narrowed it down to Luton, Stansted, Gatwick, and Southend. Then it was simply a case of looking on National Rail Enquiries’ Stations Made Easy for photos of each of the stations, and I found one of the overbridge at Southend that looked similar enough. Q7: This one was fun. Carto Metro was indeed my first source, and I double-checked it against the London’s Rail and Tube Services Map. I initially thought the question was harder than it actually was, that the saint actually had to be the same person, so I spent rather a lot of time researching which actual saints each place was named after. But I then also started searching for other place names that seemed likely, mostly looking at Wikipedia pages for interesting-sounding London place names that existed in at least two stations, to figure out where the names came from. I eventually found that Merton was named after a priory named after a saint. Q12: Google, google, google. I eventually came upon a website describing Paddle Steamers of the Glasgow & South Western Railway. Confused at how I got to such a page, I searched within the page for King and sure enough found reference to a King’s Cross, so now I was pretty sure I had the answer. Q13: This one was fun. I have little knowledge about London Bus routes, though know a little from reading Diamond Geezer and working in the area. I got the fourth one easily because I see it from time to time and I also happen to remember a Diamond Geezer article about it. Next, I figured out the second one, because I used to work in Finsbury Square and so knew that Finsbury Park to Finsbury Square was quite likely – it was simply a case of finding out the number from that. Then I got the first one by exhaustively searching the Wikipedia list of London bus routes with numbers lower than the Finsbury Park to Finsbury Square one – I found all ones with “garage” in the name of one of the termini then checked if they went along Oxford Street. Then it was a case of figuring out the link – this took me rather longer than I hoped as I was thinking it was something special about the numbers themselves, but trying to find a pattern in the numbers while looking at the Wikipedia pages I eventually noticed that one of them was electric buses, I remembered that the fourth route was also electric buses, and it all fell into place from there. Q16: I got the Euston Doric Arch very quickly, and I knew that Catch Me Who Can ran near Euston, so I looked it up to get the proper name of Steam Circus (which also in retrospect explained the No Clowns clue). Then it was simply a case of looking on Rail Map Online for lines near Heathrow and I found the Hampton and Kempton Park Waterworks railway. Q18: This one stumped me for a little while – I was sure it was Heathrow Express, and looking on Realtime Trains pretty extensively found nothing fast, though a few trains that came close, including one that stopped at Hayes & Harlington but nowhere else. But then I had the sudden inspiration to check the TfL Rail timetable, and sure enough, found the (totally incorrect!) entry showing it didn’t stop at HAY. Q19: This one was fun too. I don’t remember what eventually led me to stumbling upon the answer but with some Googling I eventually found that one of the frames from these locations was present at one of these locations, and I was fairly sure I had the answer. Actually finding the specifics for each one to verify it was surprisingly hard, especially the Kidderminster one, there seems to be very little online about them in general! Figuring out the odd one out was a little trickier but I eventually settled on Borough Market Jn for the right reason. Q21: Didn’t get this, but would have got it if I’d managed to find something online about Feltham yard reopening as stabling sidings (I swear I actually googled that and still didn’t find anything!). I was first thinking Harrington Humps, but didn’t find anything about those – my closest bet was Tottenham Court Road, where the Central Line platforms had recently been rebuilt and Elizabeth Line trains were coming, but it didn’t really fit properly since it turns out the Harrington Humps hadn’t been removed. I also looked at Abbey Wood, but discounted it for similar reasons. Next I moved onto Hump Shunting Yards, and that seemed very promising, and I googled each closed hump shuting yard that seemed promising for re-opening as sidings, but even though I specifically did google Feltham I just didn’t find this information. Shame. Q22 a) I remembered this one from perhaps LR or perhaps Diamond Geezer, so answering it was trivial. b) I remembered that Angel Road was being rebuilt and thought it might get a bay platform, so checked the details and sure enough, it’s on the platform 0 side and should be happening in 2019. So hopefully I’ll get a point for this even though it wasn’t on the list. King’s Cross was trivial, as I just knew the answer. c) I use Paddington relatively often and remembered looking on with interest as the platforms were rebuilt, so again, this was easy for me. A18 : Peak : £10.50 Monday to Friday from 0630 to 0930. Off Peak: £10.10 At all other times including public holidays. TfL should also show the National Rail fares. A21 : I may be the only one on the fares hump for Epsom/Redhill! Next year could the original question be included above each answer, so that I do not have to keep swapping between two pages? PS. I got only got 2. If it is me that does it, then I’ll do that next year. I didn’t this year because the answers (+ vaguely relevant add-ons) made each answer quite long and because I thought it would be obvious from the comments what question it refers to. But, given this is the second request, I will do it. When can what be made? Checking trains.im today I can see several trains that are non-stop from Paddington – Heathrow 2/3 – eg http://trains.im/schedule/P10060/2019/01/04/ I assume these haven’t started running since NYD. Chris J matches my day to day observations. Platform 12 may have previously appeared to be the same length as 11 (and 1-10) but this was deceptive as it ended prematurely half way down the station, making way for the track element of platform 13 beyond. Rail access to platform 12 was awkward too as trains had to transit the far end of platform 11, effectively limiting the useful length of that as well. The realigned version combines 12 and 13 into a new full length 12, and I suspect this means 11 and 12 are both now able to operate independently with HSTs and full length Class 800s/802s. Platform 14 remains the short face opposite the tube platforms 15/16. If you look on Bing Maps ‘birds eye’ view here you can see the former layout – there is no visible evidence of platform 12 outside the shed, you can see a train in the old platform 13 and the track alongside is platform 11. You can clearly see how there’s only space for two tracks between 10/11 and 13/14. Count the platforms from one end or the other if you’re not sure which is which. Google shows a more recent view, still with the old layout. Here you can see the front of Class 165/6s in both 13 and 14. If you look very closely at the track alongside platform 11 beside the footbridge, you can see the very tail end of the points that led to the old platform 12. I didn’t have time to look at every question in detail but was pleased to have got a fair number correct for those I did . I suspect I would never have got an answer to the Duchess question despite a fairly serious amount of delving. That’s a bit ironic, because fairly early on I realised that in Q10, Kings Cross might refer to Sydney. That there’s a Kings Cross on Arran as well would never have occurred to me! 7: “Name any saints that have two former or current stations that reference their name. You can see the P13 canopy and edge being extended across to the relaid P12 edge and track alignment. The question specifically says “reference their name” and does not require – as I read it – that the stations should be named after a saint. Victoria is the name of a saint and Victoria Stn references the name Victoria. That is surely all that is required? Furthermore St Paul’s is named after a Cathedral not a Saint. The cathedral is dedicated to the saint, the station is named after the Cathedral. ‘Ladywell’ does not reference the a name at all – “Our Lady” is a title, not a name. Therefore it references a saint but not the name of a saint. I have changed the wording to reflect the considered opinion that it was platform 12 that was extended as a result of platform 13 being decommissioned. On the subject of saints, I believe clarification in subsequent comments made the conditions perfectly clear. One can try and pin down the exact meaning in questions but only if they are allowed to get very long. I can’t see any difference between St Johns (named after a nearby church) and St Paul (named after a nearby cathedral). You weren’t penalised for an invalid answer so the only people with any morsel of grounds to complain are the ones who didn’t include an entry that was allowed. Once again, No. Not least because there was nothing special about 2018 and the Waterloo & City line being closed for around seven weeks in total up December 1st. It happens every year. “extension of the London Overground to Barking Reach”. You mean Barking Riverside. It proved surprisingly difficult to identify which of several saints with the same name each station referenced, but I think all three St Marys are Virgin rather than Magdalene, and both St Johns are probably the Baptist and not the Evangelist. But St James the Great or the Less? St Margaret of Scotland or of Antioch? Even if the church is still extant, the parish websites are often very reticent about which saint they are actually dedicated to. The Duchess question I found by putting “Duchess Argyll Kings Cross” into Google Images and finding a picture of a ship. 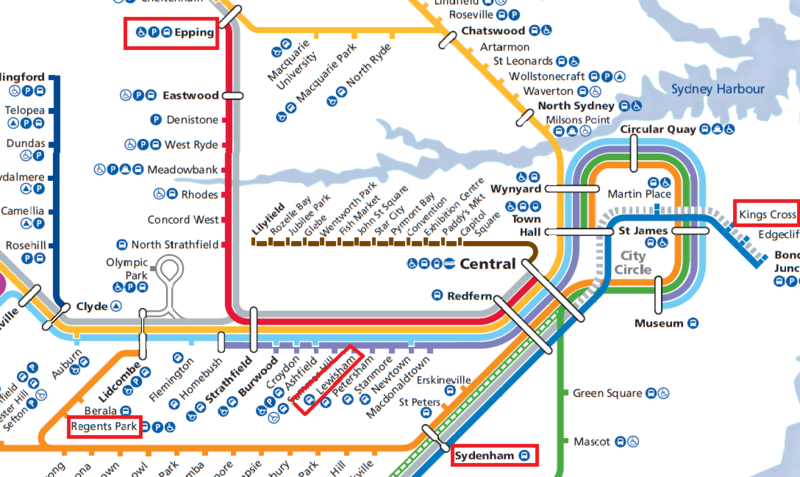 Q10, I realised must be some city which likes borrowing place names from the Old Country – googling “Epping Station” and checking the disambiguation page led first to Melbourne, but that didn’t fit and the only other Epping was in Sydney. @Colin Newman. Those trains are Heathrow Express services, on which a higher fare applies. The only Heathrow Connect service which was not advertised to call at H&H in the old timetable was the 0456. The Harlesden anomaly I found by checking the “Station Facilities” pages on the NR website for all NR stations also served by the Underground to find one which was both managed by LU and had a ticket office. Harlesden was the only one that came up. That very much depends whether you have a Port of London Authority map in front of you or not! Yes, to me the area always has been Barking Reach and still is. It is remarketed as Barking Riverside which will almost certainly be the name of the station. So I would argue what I wrote wasn’t wrong – but I did mean to write Barking Riverside. over the public address systems of metropolitan railway stations. (a) `Awe lathers trine nair stannenat num-rye teen plafform pliz. Though I did not submit an entry in the 2018 quiz would be interested to know winning scores etc. It is written up. Not by me by but someone else to whom I am extremely grateful. We are just waiting for the editor to get a moment to publish.